What better way to proclaim your Love for one another than with the Bold and Beautiful Colors of The Majestic Peacock! Imagine the elegant Celebration you can create with the gorgeous hues of green, blue, teal, bronze, and gold, as your backdrop! I've brought together some unique and stunning Peacock inspired invitations, Peacock feathers, beautiful Peacock inspired accessories, and even Your Peacock Wedding Dress for you to enjoy! 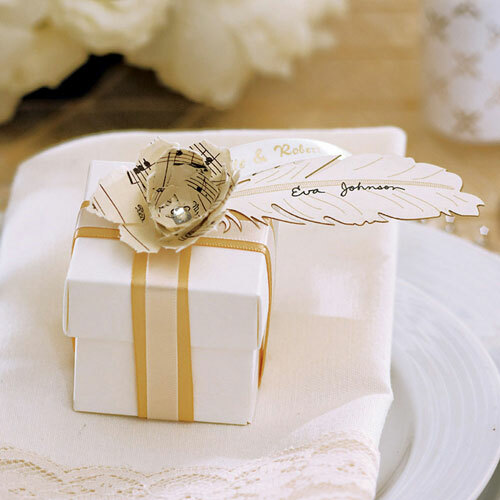 This stylish feather paper tag will put the finishing touch on your favors or décor. The laser detailing is amazing. Thread a ribbon through the feather or perch on a glass to create a floating effect. Space is available to hand personalize each tag with a guest's name or brief message. This white z-fold invitation gets tucked away into a translucent pocket with a peacock feather on the front. This insert comes with a black pre-cut ribbon. Crystal Bouquet Jewelry is the hottest trend in adding wedding glamor to the bridal and bridesmaid bouquets, centerpieces and even wedding cake toppers. Dazzle your guests with the glamorous bouquet jewels for an absolutely stunning touch of sparkle. All right, I admit it, this fabulous dress is actually a Quinceanera gown, but imagine this as your Peacock Wedding Gown! Seize the day in this luminous crystal organza ball gown by the House of Wu. A shimmering Quinceañera gown featuring spaghetti straps and a sweetheart neckline with pleated fabric on the torso to accentuate your curves and a full skirt in a kaleidoscope of color. This elegant clip combines brown feathers and peacock feathers with a rhinestone ornament. There is a clip in back, so you can use this deco as a hair clip or to decorate your wedding accessories. Only $10! Peacock Hair Fascinator! Available in Purple, Turquoise, Black, Brown & Fuchsia! This feather fascinator features a dramatic peacock plume inspired by one of Hollywood's famous weddings. This gorgeous feather headpiece is available in: Brown, Purple, Turquoise, Black or Fuchsia. Each feather fascinator has both a Spring clip and brooch backing so you can clip it in your hair, pin it to a dress or even use the clip to fasten a shawl without piercing the fabric. Perfect for bridesmaids, proms and nights on the town! White satin collection with royal blue grosgrain and jade satin ribbons, rhinestone-studded adornments and peacock feather accents. This Gorgeous set includes all five pieces shown in photo. A symbol of beauty, the peacock inspired this ecru, tea-length card invitation. Two peacock feathers encase the wording of your invitation to add a sophisticated touch. a reception special. Add a fabulous finishing touch to your affair with these vibrant essentials. This ensemble includes: a favor tag, a seal, place card, and table number. Enclose your invitation, direction or accommodation card and other enclosures in this bright turquoise pocket, tied together by a black satin ribbon! The shimmer invitation features a black border and peacock feathers. Brilliantly simple. Classically designed. Memorably personalized. With all the color and design choices for our Personalized Glass Votive, you'll quickly discover your event's color palette and these versatile favors are a perfect match! rhinestone-studded adornment, and peacock feather accent. This beautiful aqua rhinestone hair comb measures 4" in length and 1.75" wide. Silver plating combines with a lovely series of aqua rhinestones that make different flower shapes. A three-pronged hair comb is in back. your wording printed above brightly colored Peacock feathers. A bright white invitation is layered on top of a teal shimmer backer. A peacock feather design adds a whimsical touch. The black shimmer pocket is perfect for adding your matching enclosures. Dazzle your friends with this pair of Peacock's Tail with Black Feather earrings, crafted with a keen eye to fine detail and design. Nothing says class like a great pair of earrings, and no one makes great earrings like Pugster! These Wonderful Personalized Peacock Tins come already filled with white heart-shaped peppermints! What could be more perfect for your Peacock Wedding Theme! Beautiful Strapless Peacock full-length gown! Perfectly Peacock! Strappy shoes with peacock feather and 4" heel!